The myth of the spiritual spaceman. The evidence for this conclusion was anecdotal, but journalists seized upon every scrap; in time, the image of the astronaut as emotionally and spiritually transformed by a visit to the moon implanted itself in American popular culture, regardless of whether it was actually true. It mostly wasn’t, but some people seemed desperately to want it to be. Three years earlier, transformation—spiritual or otherwise—was the last thing on the astronauts’ minds. To Norman Mailer, trailing the Apollo 11 crew for a book project that would become 1970’s Of a Fire on the Moon, that was exactly the point. America had chosen to undertake a mind-bending, age-defining exploration using a workforce of squares and the technological accoutrements of high modernism; spiritual flights of fantasy were a luxury that Apollo’s tight scheduling wouldn’t allow. NASA had selected the Apollo crewmembers as astronauts precisely because the men wouldn’t freeze up, consider their mortality, or change their religions when confronted with strange new sights. Sure enough, they didn’t. 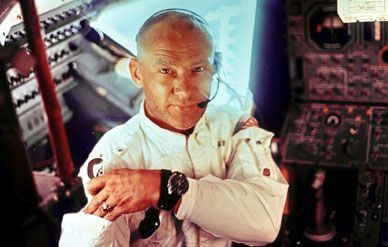 The books, articles, and movies about spaceflight prior to Apollo 11—Martin Caidin’s 1964 novel Marooned, television’s I Dream of Jeannie, Robert Altman’s 1968 film Countdown—traded in the construct of the brave American spaceman meeting a peculiar Cold War challenge with stern efficiency. By 1969, though, America had won the moon race, and fear of the Soviet Union had been replaced by a fear of something more amorphous: nonbeing. As the Apollo astronauts carried the flag of Big Science to the moon, the Earth was gripped by new critiques of state-sponsored technology, and by concerns over the future of human society. These were some of the comments that filled the pages of American newspapers: testimonials by leading luminaries in the Times on July 21, 1969 alternatively praised and condemned Apollo 11’s achievement, but almost always in messianic terms. Only Pablo Picasso seemed wholly unmoved by the fuss. “It means nothing to me,” he declared of the moon landing. “I have no opinion about it, and I don’t care.” Picasso’s apathy was incongruous; even the Left seemed gaga over Apollo 11, if only because it proved that America’s military-industrial complex was capable of something besides waging war. Even before the astronauts had reached the moon, popular culture about spaceflight had turned darker in tone. David Bowie’s 1969 single “Space Oddity” presented radio listeners with a fictionalized astronaut (“Major Tom”) in psychic distress, an image for which American listeners weren’t quite ready. (It would be many years, in fact, before the song charted in the United States.) By the end of Apollo, though, the nation that had sent the astronauts to the moon was less troubled by the thought that the men might be real human beings than by the idea that they might not be. In a fit of marketing genius, NASA, had, early on, decided to let its astronauts draft their own public statements. The results varied from the profound to the profane, but felt genuine in a way that endeared the men to the public. Reviewing the policy in 1972, NASA concluded it had made the right choice: the astronauts were often inarticulate, but always authentic. Astonishingly, upon their retirement from NASA, some astronauts began to act even more human than was necessary: avoiding journalists, drinking a lot, and acknowledging that they sometimes felt overwhelmed (another luxury Apollo never allowed). The successful completion of Apollo’s lunar flights didn’t change the men so much as give them time and opportunity to express aspects of themselves that they had kept quiet while in the space program. Most of them, particularly the senior astronauts with command responsibilities, took the work in stride and returned home to pursue other professional challenges: business, government service, teaching. If their junior colleagues reflected more on their experiences, the interests they disclosed on their return to Earth were the same ones they had before they left: Buzz Aldrin had brought his communion kit with him on Apollo 11, Alan Bean had been learning to paint well before Apollo 12, and Edgar Mitchell was already interested in extrasensory perception when he arrived on the moon on Apollo 14. To a public seeking answers from new sources, though, America’s increasing sense of social dislocation appeared to be a disease for which astronauts, with their physical and spiritual remove, might have the cure. What did NASA’s astronauts have to say about how Earth’s strife-ridden societies should resolve their differences? Not much, really—that wasn’t why they were there. The astronauts had no time to study politics while training for the moon. Tom Wolfe would eventually lionize the earliest astronauts as steely-eyed and nonverbal, but in 1972, people still expected these well-groomed sons of America to lay it on thick for reporters. Most of them, Apollo 17 Commander Gene Cernan recalled in Andrew Smith’s Moondust, couldn’t give people the answers they wanted no matter how hard they tried. That didn’t matter, though; the less the astronauts spoke, in fact, the more wise they seemed. Mostly, they said that the Earth looked nice from space and should stay that way, and that political borders were invisible from 100 miles up. Few could argue with that. Magazine exposés about returning astronauts and films fictionalizing their supposed spiritual journeys soon followed. Articles from 1973 and 1974 in Esquire and other publications suggested that a few of the astronauts (even the rock-steady Original Seven) had taken up countercultural pursuits or thrown their lot in with far-out causes. Meanwhile, movies like Silent Running (starring Bruce Dern as a whacked-out space environmentalist) did what American entertainment had always done, sell back to the public their own preoccupations by breathing new life into traditional narratives: the Western, the war film, the road picture. Instead of the lonely gangster or misanthropic mountain man (the heroes of other movies of 1972), the wise, crazy spaceman became the new archetype. By 1976, a character in the film The Man Who Fell To Earth could declare retired Apollo astronauts to be “basket cases” without even explaining the comment to the audience (and despite a cameo appearance by Apollo 13’s well-adjusted Jim Lovell). While most astronauts kept a low profile after leaving NASA, a few settled nicely into the role of “ex-astronaut,” a new kind of public intellectual about which people demonstrated an almost bottomless curiosity. In the early 1960s, America’s astronauts had been models of self-effacing sacrifice: respectable, patriotic, and courageous. “To our relief,” Muson declared in 1972, “they now seem much like us.” Visiting the moon, though, hadn’t changed the astronauts nearly as much as it did the public, which felt the “rapture” and wondered why the men who went there mostly didn’t. Matthew Hersch, a Ph.D. candidate in the University of Pennsylvania’s Department of History and Sociology of Science, has been named an HSS/NASA Fellow in the History of Space Science, and was a Guggenheim Fellow of the Smithsonian Institution’s National Air and Space Museum. He is writing a labor history of American astronauts.